There are a few free MP3 software players to play your MP3 music, and depending on what you require, there are basic players to more comprehensive players. Additional features such as plug ins, various skins, different format support, tag editing, play lists, streaming, equalizer effects, etc, might influence a player suitable for you. Here are some free MP3 players that might be suitable. Please note: - These MP3 players are currently free, so rather than add their site links in case if the site is removed/renamed, or if the player becomes shareware, version dependent free, renamed/re-branded etc, it might be better to search them online. Image of Equalizer By JWilsher at SXC. 1by1 player: Directory based player with explorer like navigation, with play list, cue sheet, and plug in support. Sound base 2009.4.27: Simple audio player that organizes by album, based on ID3 tags. Has sidebar for easy navigation. db Power Amp Audio player: Supports various formats - wma, ogg vorbis, real audio, midi, monkeys audio. Slimline MP3 player with visualizations, skins, mini controls, play list editor, graphics equalizer, and selective playback. MP3Coolplay-X: Plays popular formats, and streaming media from the shoutcast server, and can apply real time effects via the DSP built in engine. Cool Player (http://eu-soft.net/): Fast MP3 player and supports other formats (OGG, WAV, WMA, and others). Includes graphics equalizer, skin support, audio ID3 tags, mixer and other settings. Bodie's Hi-Fi System 1.08: Musical player of MP3 audio and other formats, and attempts to read/write tags of saved audio files. foobar2000: Plays not only MP3, but various common formats, with customizable interface, advanced audio tagging, CD ripping support, and keyboard shortcuts. Ultra Player: Usual audio format support, looks and sounds good, record internet streams, and has an auto alarm. AIC Audio Player 1.3.1.563: Simple and easy interface player software that supports many formats: MP3, WMA, OGG, AAC, Flac, Ape, CDA, AMR, Vorbis, PCM, and many other formats. T Player: Might suit DJ's, as it allows easy cue, mix for playing and includes auto mixing. Supports MP3, wma, ogg vorbis, and wave audio. Also has dual independent players, search function and play list support. Spider Player: Good sound quality, DSP effects, radio directory, with custom hot keys. Includes cross fading and surround sound. Sonique Player: Has animated menu's, various options, good sound with various format support, tag editor and 20-band equalizer. Has new decoder upgrade for enhancement. Simple MP3 Player: Free player, ripper and encoder/decoder, has play list manager, jitter-correction, and ID3 tag editor. Small utility to download. Apollo MP3 Player 37zz: Noted as generating quality audio from MP3 files and advanced play list system. Al Song (visit al.tools.com): Free audio player download, that can display lyrics (if available) by automatically downloading when a audio file is played. Supports MP3, OGG, WAV, FLAC, CD's, and others. Billy: Small software MP3 player, that quickly plays a directory of MP3's. MP3 Tunes: Another DJ MP3 free player - Includes play lists, cue, ID3 tagging, cross fading, and other features. Winamp: Popular software utility, with hundreds of skins and visualizations add ons, plenty of equalize customizations, ID3 tag editor and supports CDDB for automatic title listings for CD's. Easy to use with streamlined player interface. Essential MP3 Player: Automatically downloads MP3 album covers and lyrics for your MP3 files. Juster enter the title of the audio track and artist name for automatic retrieval, and apply the tag editor for absent information. You can multi select tracks for a instant play list creation. (Complete Media Player 1.00): Minimalist player for audio and video files, including MP3, DVD, and WMA files. So there should be a free MP3 audio player software player for download to suit your needs, perhaps for simple fast playing, and DJ cross over playing-fading. Also visualizations for a computer or movie screen, or to transfer to a portable MP3 hardware player or mobile phone for easy listening. Visit Free Mp3 Recorder Software Downloads (mainly small recorders) and Free DJ Software Players and Mixers. 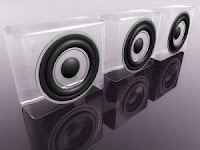 Image of Music Speaker By Clix at SXC.